The holidays are a time when you choose a variety of ways to celebrate your family and what you have been given in life. One small way you might choose to do that is by preparing a hearty meal with treats to match. You probably also decorate your home with festive ornaments. Well, why not meld the two together and make your treats decorative too? 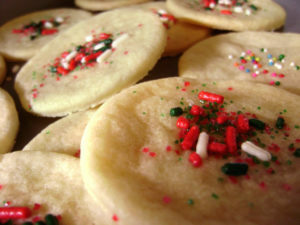 The easiest foods to make festive are desserts, though you can implement the idea in other ways too. A simple and tasty chocolate snowman shaped cake is easy to make and highly festive. Best with Dutch cocoa, you can use coconut flakes to create the coating. You can use black licorice sticks for the arms, black licorice drops for the eyes and peppermints for buttons with gum drops on top. For the mouth, you can use a piece of red shoestring style licorice. Fruit leather makes a great decorative scarf. 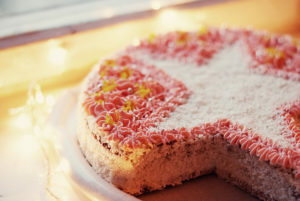 Alternatively, or in addition to, you can create a Christmas tree cake with equal festivity. By creating individual cake squares, you can stack these to create a tree-like shape with green frosting and other colored frostings to your liking. You can use candies for ornaments and smaller cake squares decorated with colored frosting to make presents under the tree. Gingerbread houses are a classic way of creating decorative treats. However, there are more creative ways to make artistic gingerbread treats. One less known design is the gingerbread lantern, created by four rectangular pieces of gingerbread connected by frosting. You can cut holes in the pieces to let the light out, such as stars or hearts. Once settled, you can place candles inside these and use them as actual lanterns. Another creative design is the gingerbread train. You have a great amount of creative license with this, in that there is room to decide how intricate you want to get with the design. However, there is a minimum amount of intricacy involved. The frosting is used for piping and a combination of circular and rectangular gingerbread cookies create the body. You can use candies, licorice and frosting to decorate it anyway you like. Gum drops work well to top the train while licorice works well for the pistons. You can also decide how long you want to make the train. If you are looking to go more gourmet than flashy, you can make chocolate espresso snowballs with fair trade coffee. Using cocoa, pecans and sugar you can have a treat both decedent and decorative. There are plenty of ways to brighten up holiday cheer just with culinary creativity. For many people, cooking for the holidays can be frustrating and stressful. This year, though, instead of rushing around in a frenzy, try out these festive holiday cooking tips. Instead of rushing around the day of your holiday dinner, plan ahead. Since most of the stores in your area will be closed on the holiday, make sure you have everything you need a few days in advance. This can include spices, vegetables, condiments and beverages. Making a few dishes ahead of time can also save you the hassle of preparing them on the holiday. Baked dishes, like pies and rolls, for example, can usually be made a day or two before your holiday meal and stored in airtight containers. Dishes like mashed potatoes can also be made up to three days before your meal and stored in a refrigerator or freezer. Remember that the most important thing about the holidays is family and friends. While a huge, fancy, extravagant holiday dinner is nice sometimes, ask yourself if it’s really worth the stress. Prepare the traditional turkey or ham, but keep the side dishes simple. If your dinner guests will be arriving early, a simple vegetable or cold cut tray can also be put out as an appetizer. Also, don’t think you have to go it alone. If one of your guests offers to bring a dish or help out, by all means, accept the help. It’s the holidays, so have fun. No one ever said that cooking a holiday meal had to be boring. Put on some festive holiday music and rock out! If your kitchen is big enough, try to get your family to join you. Not only will you get some free helpers, but you’ll also have a blast. This may seem like an odd festive cooking tip, but don’t dismiss it. Always make sure that you will have enough plates, bowls, platters and cutlery for your holiday dinner. Running out of clean silverware or not having an adequate number of plates for your guests can be very frustrating. Even if you’re expecting only six people at your holiday table, always plan for more. Any number of things could happen and there is always a possibility of unexpected guests showing up. To accommodate them, borrow or buy some inexpensive folding tables and chairs and keep them stored until they are needed. Forgo passing the dishes around the table this year and opt for a buffet-style holiday dinner instead. Set up a long table with plates at one end and the food spread out in a line along the table. Doing this allows your guests to choose their own food in an orderly fashion and it keeps messy dishes off your table. Most food can be kept warm with the help of slow cookers, electric roasters and electric skillets. If you are hosting a very large holiday dinner and do so frequently, you may want to consider purchasing or renting some catering equipment, such as chafing dishes and serving platters. Kitty Says: Do not cut the bread! It’ll pull apart easily. Preheat oven to 350°F. Grease a bunt or tube pan. Mix sugar & cinnamon in a large resealable plastic bag. Cut biscuits into quarters. Shake 6-8 biscuit pieces in the mixture. Arrange the pieces in the bottom of the pan. Sprinkle each layer with raisins & optional nuts. Continue the process until all biscuit pieces are coated & placed in the pan. In a small pot, over medium heat, melt the margarine with the brown sugar. Boil for 1 minute. Pour over biscuits. Bake for 35 minutes. Remove from oven & let cool in pan for 10 minutes. Turn out onto serving dish/platter. 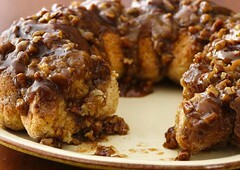 Photo courtesy of Betty Crocker Recipes on Flickr.